A luxurious bubble bath has incredible returns but only if it's done right. Enjoy these tips from Toronto executive housekeeper Agnes L. whose skills to draw the perfect bath are second only to her ability to make a beautiful bed. Lighting: Soft lighting is key, so haul out those candles to add some warmth and flickering glow. Candlelight is magical against the still water. Agnes says to avoid scented candles, she believes in infusing fragrance via bath salts and essential oils. Music: While this is an area of personal preference, low and quiet is important to help lull you into conscience relaxation. Suds: This is the ultimate bubble bath: a thick, dense blanket of bubbles embracing you in the tub. Bath bombs, bath gel and bath foams are all options. 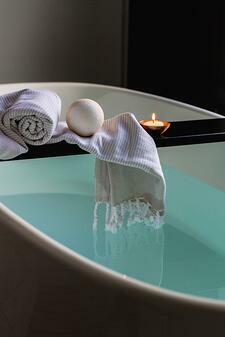 Salts: A salt soak is the perfect antidote to a stressful, tense day. Agnes swears by Himalayan rock salt and seas salts sourced from the Dead Sea. She mixes her own blends, alternating 1:4 ratios of dried organic lavender, dried rose blossoms or bergamot leaves to salt. She stores the infused salts in sealed glass jars, ready for bath time. Slick: An essential oil is key for moisturizing the skin. Layering essential oils on top of salt infusions yields a well-rounded bath and supple, hydrated skin. Lavender, rose blossom, spearmint, and citrus extracts act to either relax or reinvigorate. Her knock-out punch: a robust blend of eucalyptus and mint. Libations: Agnes reminds us that just because you are soaking in water doesn't mean you shouldn't be staying hydrated. We presume she is suggesting a glass of champagne, but we suppose some sparking water wouldn't be a bad idea either. Warm, fluffy towels, a fresh robe, and slippers should be well within reach. A seamless transfer from the bath to whatever is next on the agenda is key. In our mind we hope it means sliding into a warm bed with a good book and a cup of camomile tea. Night, night.